Fitting Toric contacts (for astigmatism) may be more time consuming than fitting spherical lenses. This is because toric contact lenses are different than standard spherical contact lenses. Spherical lenses: either thin in the centre (minus power for nearsighted people) or thick in the centre for farsighted people (plus power). As you go around the clock of the lens, thickness is uniform. Toric lenses: thickness varies throughout the lens. This allows astigmatism correction to be added to the prescription. Toric contacts are made to made to correct for astigmatism in a prescription (click here for more on what astigmatism is). Because of these differences, they are more complicated to fit than other lenses. In a spherical contact lens, there are three parts to the contact lens prescription: (1) the Brand (2) the curvature, and (3) the power. In a Toric lens, there are an additional two parts that need to be accounted for: the cylinder (cyl) and the axis. The way the lens fits must be assessed by the contact lens fitter, and each problem addressed individually. Toric lenses also take longer to settle than standard lenses, and after being worn for several hours or days may not be the same as when you were in the office. If you have never worn contacts before, you may need to wait for trial contact lenses to be ordered if you need a Toric lens. Once they come in, if you are lucky, the first pair you try will work for you. However, it is not uncommon to need to try different lenses; the higher the astigmatism, the harder it is to get accurate vision with soft lenses. Even if you have worn contact lenses before, if there is a change in your prescription and/or if you are trying a different brand, you should try the contacts first to ensure the vision is good for you. Sometimes there is a small axis (rotation) change of 5 degrees which may or may not require a change in the contacts you order. So do not be surprised if you have to wait to get contacts before fitting toric contacts; and be prepared to trial a pair or two (or more) before you finalize the fitting. If you have never worn Toric contact lenses before, there are some points you should be aware of. 1. Weighted Lens - Most Toric lenses are weighted so that your vision is stabilized. When placing this type of lens on your eye, it becomes a bit of a challenge because the weight can tip and make the lens unbalanced while attempting to insert. TIP: instead of moving the lens across towards your eye, try moving the lens in an upward direction towards your eye. 2. Acuvue Toric Lenses (Oasys, Vita, Moist and Oasys 1 Day) - These lenses are designed differently from other Toric contact lenses. Instead of a weighted edge to keep the lens from rotating on the eye, these lenses have differing edge thicknesses. The edges touching the eyelids are thinner, and the other edges are thicker. You may notice that when these contacts are placed on the finger, they tend to roll up. This is normal for Acuvue lenses with astigmatism correction, so don't think there's anything wrong with them. 3. Most Toric contact lenses have "scribe" marks, which are little lines on the contact lens that indicate to the eye care practitioner that the lens is oriented in the correct position. You can use these markings to your advantage as well. If you can see them (it's harder if you are farsighted or presbyopic), the little lines go toward the lower lid with most lenses. With Acuvue lenses, there are two lines: one at the top (upper lid) and one at the bottom (lower lid). It doesn't matter which one goes top or bottom. 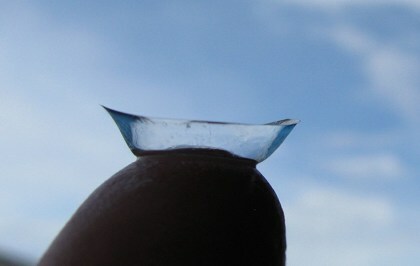 Toric contact lenses are a bit thicker than other contact lenses. This makes them a little more durable than typical contacts. You still do need to be careful with them though, because they still have one edge that is thinner and more prone to tearing. Otherwise, care for your Toric contact lenses the same way you would other contacts. Take note of whether they are monthly replacement, two week replacement, or daily disposable lenses. Sharper vision. The higher your astigmatism, the more Toric contacts can help you. This is the greatest benefit to Toric lenses, and the reason they were made. More durable. Because lenses are thicker, they resist tearing better. Usually easier to tell if inside out. Comfort has greatly improved in recent years. While there are some great benefits to wearing Toric contact lenses, particularly the better vision available, there are some drawbacks. Thickness that allows the lenses to be more durable can sometimes interfere with comfort. Although in recent years Toric lens designs have been made more comfortable, they will always be thicker than standard contacts. Price. Toric contact lenses are almost always more expensive than other, more basic lenses. Size. Toric contacts are made larger in diameter to make them more stable on the eye. 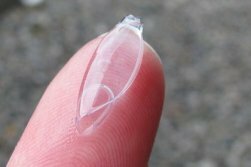 This size can occasionally cause discomfort, and make lenses more difficult to insert. Instability of vision. While the best benefit to toric lenses is the sharper vision you get when the lens fits well and rotates correctly, the same forces can cause a toric lens to sit improperly on the eye and cause vision to fluctuate. This is what makes toric lenses harder to fit, since everyone has different sizes of eyes, and there are limited sizes abailable in soft toric contact lenses. Fitting Toric contacts can be quick and easy, or it can be frustrating and require a lot of patience. Sometimes it can be attributed to the experience of the fitter, and sometimes the lenses available just don't fit the eye or the prescription well. However, it can be well worth the time it takes to fine tune your vision, if you would like to be able to get away from glasses and still be able to see well.